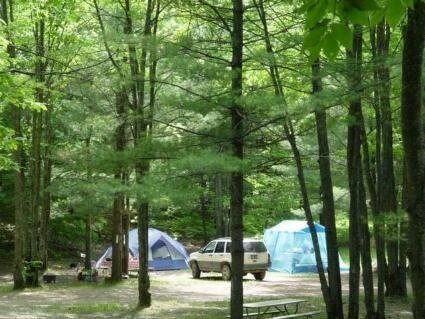 Quiet scenic wooded modern park with over 38 acres of nature trails. Kalkaska is known for its hunting, hiking, mountain bike and ORV trails plus over 83 lakes and 3 rivers for canoeing, fishing, and boating, and three golf courses. Nearby attractions in Traverse City, Lake Michigan beaches, wineries, casino, a one hour drive to Sleeping Bear Dunes and two miles to the Village of Kalkaska with a three-season Farmers Market, two grocery stores, various shops in the village, sporting goods store, three dollar stores, family and fast food restaurants.